Being pampered with restaurant foods for the last few weeks, I think I am still in a vacation hangover. I haven’t got back to a mood to cook elaborate meals. The laziness to enter the kitchen lead me to this salad recipe. This salad is made from 4 main ingredients and has a very simple yet exotic vinegrette. 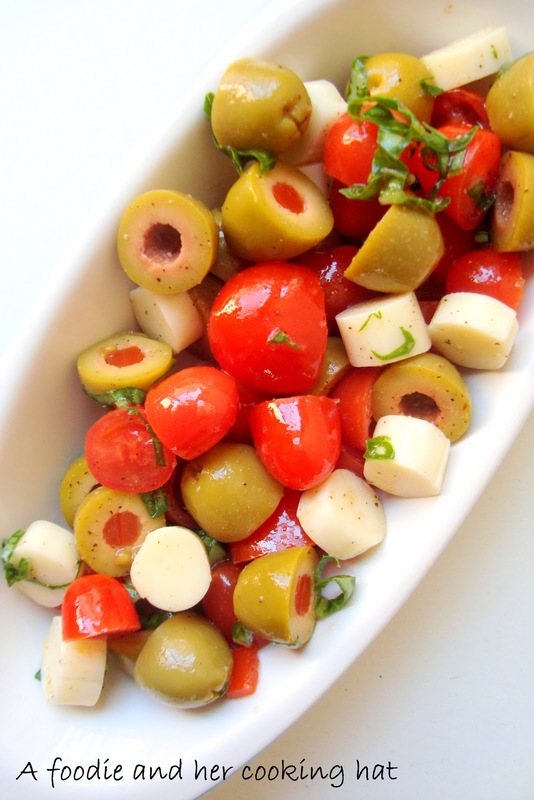 Tomato-olive salad is South beach friendly too and is also a great side for pasta. You can also add cooked pasta to it and create another version of this salad. Dice the tomatoes and olives into halves. Set them aside.Dice the mozzarella to similar size as tomatoes. Roll the bail leaves into a cigar and thinly slice them.Mix them all together and pour over the olive oil and lemon juice. Sprinkle salt and pepper to taste. Stir, cover with a plastic wrap and chill in the refrigerator until serving. 1. Ideal salad for South beach phase 1 mid-morning snack. 2. Mix in cold cooked whole wheat pasta for phase 2 and 3.
perfect for those don't want to cook grand but want to eat moods- looks great !! One of my fav combo for salad,just love it..
Looks lovely and colorful.. beautiful presentation too ! !